The Renaissance Princess costume is a dream come true! 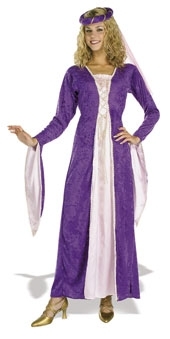 This ankle length princess dress is made out of purple crushed velvet. White and gold braid is used to trim the stripe of pink satin down the front. The bodice is laced with white and gold cord. The coordinating headpiece is purple crushed velvet trimmed with white and gold braid, and pink netting. Available in standard (to fit size 10 to 14)and large (to fit size 16 to 18).